Here's the latest column from our contributor Cara Valla, sous chef at San Francisco's Chiaroscuro. Enjoy! As the summer comes to a close, don't despair! It's time to sit back, relax and enjoy that pungent green herb we love so much . . . Sorry, stoners, I'm talking about . . . basil! Whether you are adding an herbacious tone to salads, showing off the luscious green leaves in a caprese or letting a fresh pesto hightlight the delights of this herb, you are sure to capture the freshness of summer in each bite. The old saying goes "what grows together goes together" and nowhere is that statement more true than when it comes to tomatoes and basil. Even the mingled scents from the plants in the garden create a delicious aroma. The caprese salad is a way to let these two ingredients play off of each other against a clean pallate of mozzarella. 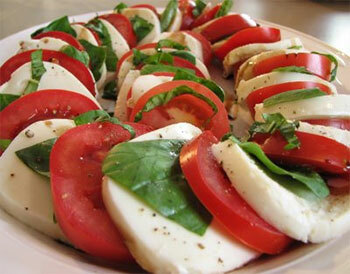 Simply slice tomatoes and mozzarella and arrange on a platter, drizzle with olive oil, salt, pepper and balsamic vinegar. Right before serving, tear basil leaves with your fingers or cut with a very sharp knife and arrange over top (Basil leaves bruise very easily so using a dull knife will also dull the flavor. It is always best to tear with your fingers rather than use a dull knife). These days it seems everyone is trying to reinvent the classics. Although this flavor combination is a knock out, you can always have a little fun with how you make all the tastes sing together. For example, you could use a reduced balsamic to drizzle over the top, or you can experiment with some other types of cheese like burrata, bufalo mozzarella or fresh farm cheese. This dish is a very classic Italian combination. It can be used as a salad, side dish or to dress a pasta. Your vegetarian friends will love you for it. In a food processor or mortar and pestal crush garlic with nuts. Add a little oil and cheese, and when you have developed a paste, add in basil. Add oil and more cheese if desired to create a loose but not overly oily sauce. 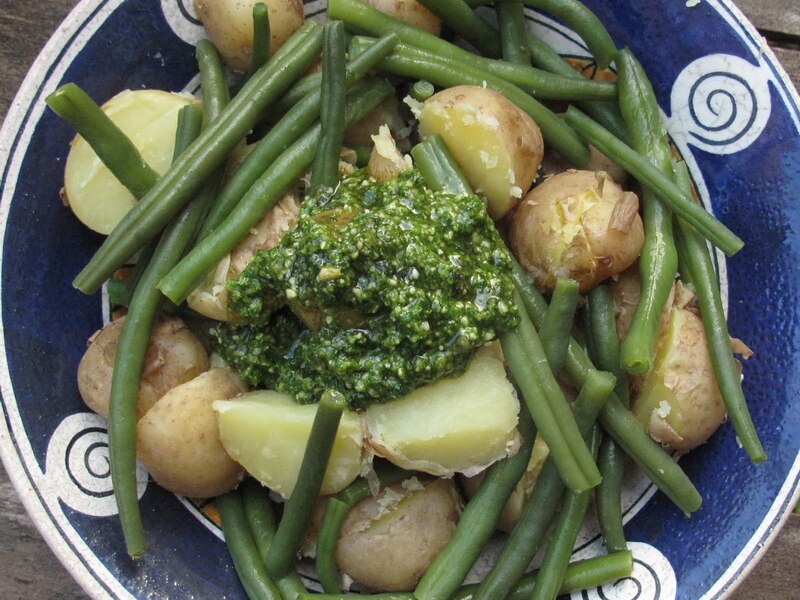 IF you are keeping the pesto overnight cover with a thin layer of oil to prevent browning! Bring a pot of well-salted water to a boil and add prepared beans. Cook for about 30 seconds to 1 minute (depending on how soft or crunchy you like your beans!) remove beans and immediatly cool in ice water. Reserve water to cook the potatoes. Add cubed potatoes to water, boil for about 5 minutes and cool immediatly in ice water. After potatoes are cooled let air dry or pat with a towel. Heat a saute pan with a thin layer of olive oil. When the oil is hot...but NOT smoking, add the potatoes and cook until crispy on all sides. Add the beans for the last few minutes. 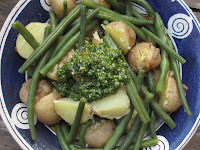 The beans and potatoes can then be tossed with the pesto and perhaps a little lemon zest as desired. I ate a caprese salad on a baguette almost every day this summer. It's my go-to favorite meal ever. Yeah, I could live in a world like that.